This is Trinity-St. Paul's United Church and Centre for Faith, Justice and the Arts and it is found on a busy section of Bloor St in the Annex near U of Toronto. 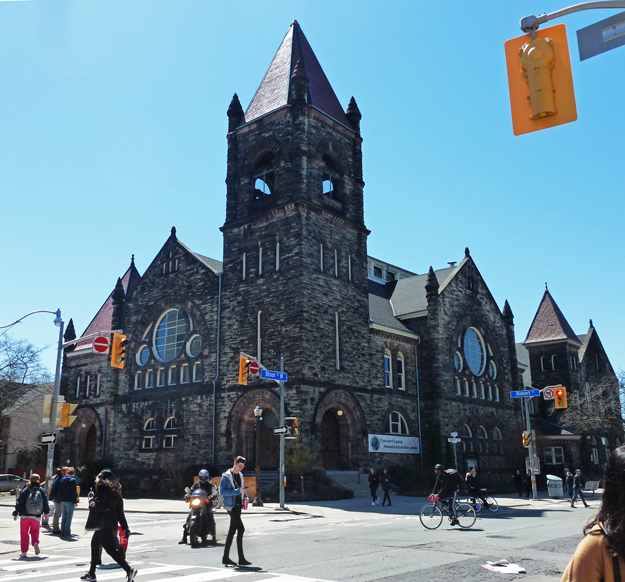 The church is home to the religious community but is also home to 60 other organizations such as the Tafelmusik baroque orchestra, yoga classes, and even Salsa dancing classes. Check out its website HERE. Located here for over 125 years this church really ministers to the community. Love that old stone church...and it is huge - no wonder they can offer to many programs. It is wonderful to see they reach out to the community. Oh I can just imagine baroque music here Pat, the accoustics would be brilliant! Incroyable church. A place for everyone with lots of different things going on. A great place for the community. It makes so much sense for a church to make its building available for other organizations.... it's a lot of real-estate to sit idle most of the week. And I suppose some of those who attend the non-religious classes might become interested in the Church and what it does as a church. Win-win! That is a very solid looking church. Hope your Sunday was good and your week ahead great. Very HH Richardson! I like these romanesque churches...they remind me of Boston. We are such a diverse city, which is why I love wandering it. Beautiful photo of this impressive church, Pat !